And just when the clouds are darkest and all that, things take a turn for the surreal. The filling station in Kalomo is the only place to get gas between Lusaka and Livingstone (480km, I believe). 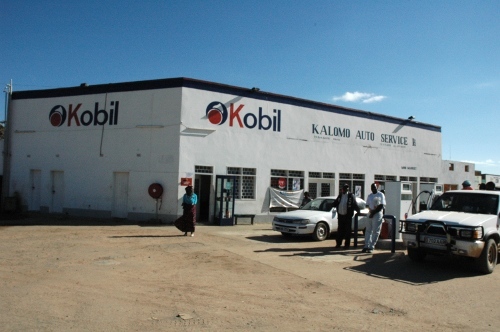 It’s also the nearest thing Kalomo has to a general store. The family that runs it is originally from India, every other time we’ve been in a very nice old lady has served us. But today we met Scotch, her son. Scotch was born and bred in Kalomo but left to live with family in the UK when he was 16. He stayed for another 16 years, qualifying as an accountant and working for the likes of Ing. Last year, his brother died, and he moved back to Kalomo to take over the other half of the family business, running a transport firm. You could say this is a man with little luck: in the UK, he says, he was four months without a job last year because so many accountants have been laid off. In Zambia the transport industry has been hit very hard by the recession. Scotch has had to leave two children behiind in the UK, who, he says, he hopes he can bring here next year, when he’s earning enough to live in Lusaka. He’s incredibly friendly. After he knocked off, he tracked us down at our hotel to offer to take us for a drink. It’s our photographer, Brenda’s, wedding anniversary today and she’s away from home, and we’d made plans to take her out to celebrate in absentia. So we made our excuses, thanked Scotch, and headed out. Not fancying a second serving of nshima today, we called Scotch. He’d gone to MacRon’s, a truck-stop about 10km out of town, to see a friend. He drove back to Kalomo, picked us up, took us back there in his pick-up, paid for our meal and drinks and drove us back again. His enormous generosity and refusal to take our money, so perfectly counterpointed by an incredibly clear African night sky on the drive home, makes me want to move here with Tamsin and Tabitha tomorrow. It’s an odd and almost too soon contrast to the conditions we’ve just left at the school today. MacRons, by the way, is a perfect dusty diner, with articulated lorries parked outside. Ron is a middle-aged, sun burnt White Zambian who’s lived here pretty much all his life. He’s a tough, Cllint Eastwood-style mix of hardness and heart that I think is typical of his generation out here. His farm has been hit hard by the droughts and his diner business is down 60% on last year due to lack of traffic. He slaps his hands and says “what can you do?” He looks like he probably slaughters the steak on the menu with his bear hands, but turns out to be a practical, resourceful man, not unsympathetic to the plight of the people around him – although he’s wary of simply giving cash to people who are already deeply entrenched in a culture of dependency. He thinks the school is a good idea , so long as the right people are running it. I think he’d be amazed and impressed at the independent spirit of George, Sonia and the other teachers we’ve met, not to mention the near brutal insistence on self sufficiency of our NGO partner Response Network and their determination to change the way things are here. He serves some of the best chicken I’ve ever tasted. If you’re in the area, it’s very highly recommended.